Parker domnick hunter breathing air purifiers are designed to reduce the concentration of potential contaminants, identified as hazardous to the human respiratory system to acceptable levels detailed in published International Breathing Air Standards. Where a potential inhalation hazard exists it is essential that a full assessment be made of the potential risk to the user. The assessment should not only identify the potential risk of contamination to the breathing air supply, but also the level of potential contamination. In the event of being unable to either remove the contamination risk or to control the risk, it is the employer’s responsibility to introduce measures to ensure that the breathing air supply complies with the required air quality standard. The air quality used in a breathing air system must be controlled under all operating conditions, including the possibility of a plant or process failure. In addition to conforming with the required compressed air quality it must also be ensured that the delivered air flow rate is at least sufficient to meet the foreseeable needs of the total number of users at their maximum work rate consumption. A medical air supply is regarded as a vital part of every hospital infrastructure and is one of the few medicines that is manufactured on-site. Compressed air can be used for a wide variety of applications such as anesthetics, lung ventilation, intensive therapy, pneumatic surgery tools, nebulizers and many more, where the quality of the air is vitally important. Parker domnick hunter BA-DME and BAM breathing air purifiers provide integrated filtration and adsorption stages to deliver the air quality required for medical applications. Parker domnick hunter purifiers have been independently tested to the European Pharmacopoeia Medical Air Standard, which is more stringent than OSHA Grade D standards. 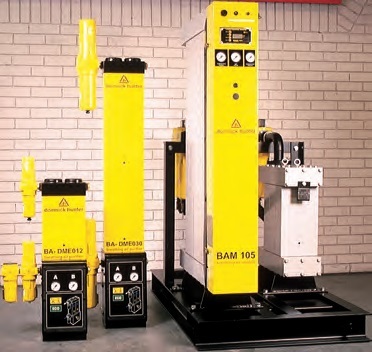 The BA-DME and BAM packages consist of several stages of contaminant removal. Inlet filtration combines to remove bulk water, particles and oil. The use of adsorption materials, namely activated desiccant and carbon removes water vapour and oil vapour/odours respectively. The desiccant material is contained in a pressure swing adsorption dryer that delivers a constant pressure dewpoint of -40°C (-40°F). Downstream of the desiccant dryer, a catalyst converts carbon monoxide to carbon dioxide by catalytic conversion. A final dust filter captures any particulates carried over from the adsorption materials.